Students look closely at snails, then collect materials to make them a habitat that can be kept in the classroom. Today we will study them closely. Then we will put them in a tank so they are safe and we can watch them. Talk about how to treat them gently. Are the snails living or non-living? (Living things use energy, living things grow, living things have babies, living things react to their environment and adapt to it (change to survive better)). Sciencey snail book to introduce parts of the snail. Show students the glass terrarium we will put the snails in. Ask what else should we put in. Talk about basic needs of snails, and add materials to list on the board as they come up. Include needs that would use soil, leaves, food, water. 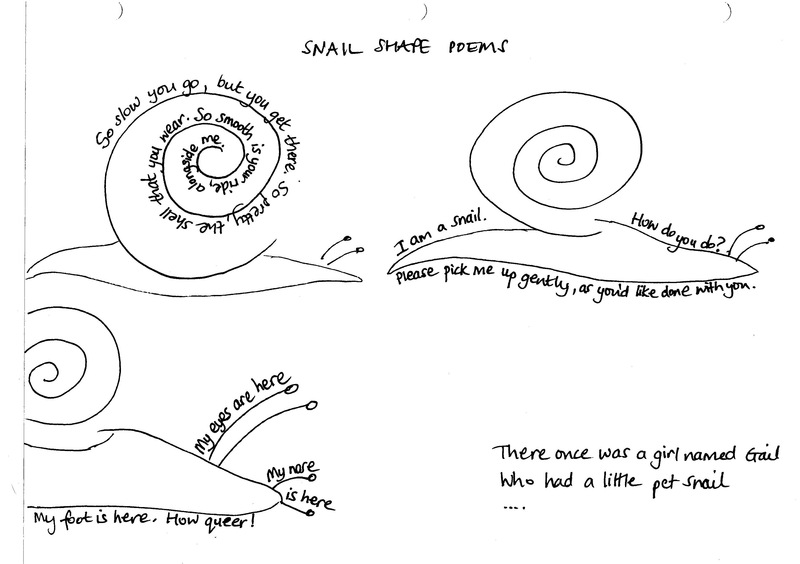 Optional linked activity: shape poem about snails (see attached document).